If you are looking for affordable range ammunition, that won't let you down, then you have come to the right place! 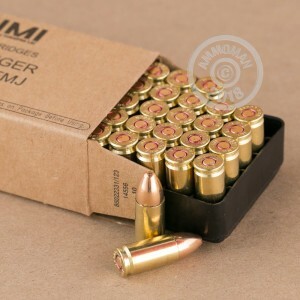 This ammo, made by Israeli company, IMI, is perfect for every type of range training you can do. It is affordable, and will function well in all handguns chambered for 9mm Luger. Each round has a 115 grain full metal jacket projectile. As well, each round has a reliable primer and powder, so that you know it will go bang every time. This ammo is brass cased, boxer-primed (with waterproofing! ), non-corrosive, and reloadable. 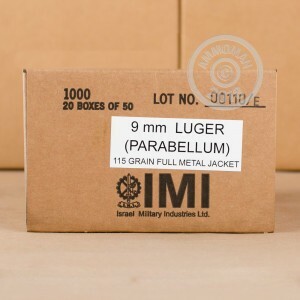 Israel Military Industries (IMI) manufactures large quantities of reliable military grade ammunition for militaries all over the world. This company makes a large portion of the ammunition for the IDF. My subguns love IMI, and so do my Glock's and SIG's. Great, accurate range ammo, I typically run 500 +/- rounds per session and I hate cleaning my guns. Thankfully, IMI runs clean, and I never really see any brass shavings in any of my guns. I really like these 9mm rounds. 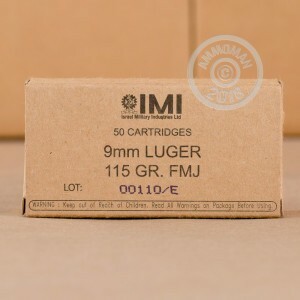 Brass cases with FMJ backed in boxes of 50. This is my second case of 1000 and I hope you keep it available. I fired around 700 rounds and had only one bullet that didn't fire for some reason.. Junk ammo do not buy. Now I'm stuck with 450 rounds. Have been using this product for almost 2 years. It is loaded to NATO standards.